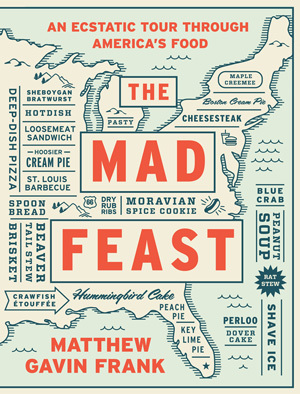 The following excerpt is from from the West Virginia essay in Matthew Gavin Frank’s book, The Mad Feast, out this week from W.W. Norton, which is a collection of fifty essays, one for each of the U.S. states. 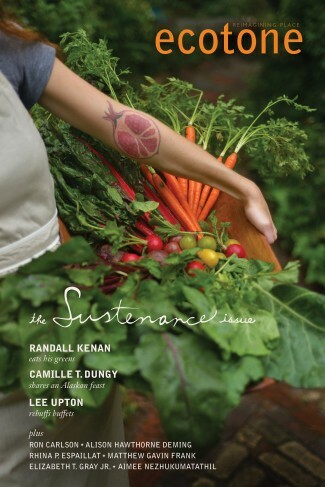 Each essay begins with a foodstuff typical of said state and then digresses from there, engaging various shadowy back alleys of regional history—sometimes beautiful, sometimes atrocious—in an attempt to uncover the answers as to why we eat what we eat, where we eat. 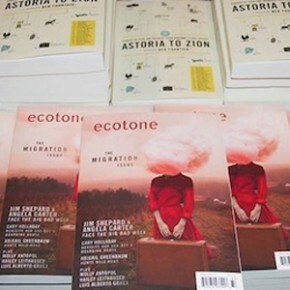 Matt’s essay, “Spoon Bread,” about Nebraska, appears in Ecotone’s Sustenance Issue. Though rat meat often bears traces of pesticides, heavy metals, and human excrement, and though most residents of West Virginia (save, perhaps, for the town of Marlinton—famous for the annual autumnal Road-Kill Cook-Off featuring such local delicacies as pothole possum stew, rat gumbo, and the awesomely named Peter Caught-on-Tail Gate Roll) long to shuck the backwoods “barefoot and pregnant” stereotype (after all, we have the lowest birthrate in the U.S.), my uncle empties the traps into a stockpot as his father and his grandfather and his great-grandfather did before him, adds the water, the tomato, the salt and pepper, and the hot red peppers (his personal touch). Uncle cracks his knuckles, says something about infertility, about eighty-hour underground work weeks, about coal as black lipstick, the sort he’d smear Aunt’s face with when she was alive and well and simmering anything but rodent on the range. According to Calvin W. Schwabe’s book Unmentionable Cuisine, step one of Rat Stew: “Skin and eviscerate the rat and split it lengthwise.” Uncle dips his face into the stockpot’s steam and inhales. He calls you to the stove, puts his arm around you. You watch the little nuggets of sour meat surface and dive down, surface and dive down. You think of the pride of Debbie “The Rat Lady” Ducommun—a Californian, no less—as she said, “I do as many necropsies of rats as I can, and between 1998 and 2003 I took measurements of the hearts of 150 rats.” You take comfort in the suspicion that you are not nearly as obsessed. You try not to think little when you think of fertility, and worry about the heritability of Uncle’s mistakes, anatomical and otherwise. You watch little heart tumble over little rib and little liver. You try to pick out the tenderloin, the neck meat. The feet. The hands. You try not to think of the appendages that anchor us into the mine shafts that only want to constrict, the earth filling itself back in, becoming whole again. This, we call collapse. You tell yourself each night in bed that those are canaries screaming into some implacable, original depth, and not the rats in the kitchen. You try not to think of stiffening bodies, of rigor mortis, of the 2010 mine explosion in Montcoal after which not a single survivor was found. The names of the dead were not released.